William was a happy little boy who lived with his parents in a green house with a lovely little garden, decorated with paper flowers. But one day everything changed. It was as if he'd been torn in two and turned into two different kids: one who went with his dad, and another who stayed with his mom. Through the Eyes of a Child reminds us of the importance of communicating, and that after a change in a family's structure, a child can feel “whole" again and grow up happily...even though his parents have separated. 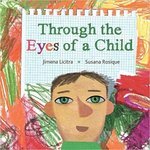 Licitra, Jimena, "Through the Eyes of a Child" (2015). DIVerse Families. 1104.